The ideal candidates will have five or more years of experience. Non-ticketed applicants will not be accepted as we do not have a journeyman in that field. A Class 1, 3 or 4 valid Canadian driver’s license in good standing is preferred but not required. The ideal plant health care specialist candidate will have at least one year of experience working in plant health care or have education in horticulture or related fields. Having a certified pesticide applicator license is preferred. A valid Canadian driver’s licence in good standing is required. The ideal grounds labourer candidate will have one or more years of experience with landscape or horticultural background. A valid Canadian driver’s licence in good standing is preferred but not required. 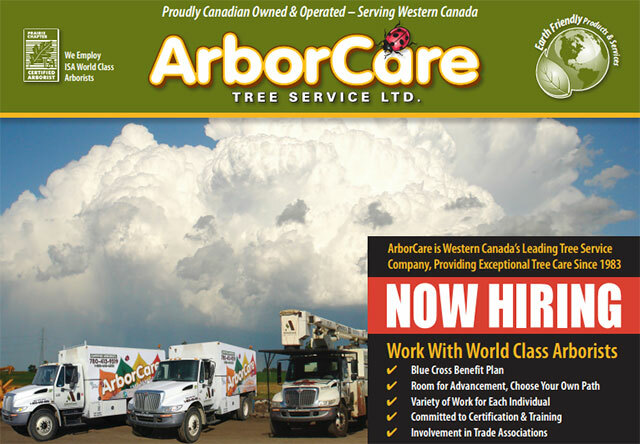 The ideal candidate for the slasher/sawman position will have three or more years of experience within the tree care industry, with knowledge of working around power lines. Applicant must have a minimum of 500 hours operating a chainsaw and have their CSTS A valid Canadian driver’s licence in good standing is preferred but not required.